#SailBessie – A fantastic opportunity to sail on a voyage to Drogheda to coincide with the maritime festival, is to see the 1904 built West Country trading ketch, Bessie Ellen set forth from Scotland on 7 June, writes Jehan Ashmore. The 110 year-old lady, Bessie Ellen, will take in a seven-day voyage involving stunning scenery and famous landmarks along the way between the embarkation port in Oban and the mountains of Mull, Jura and Islay. 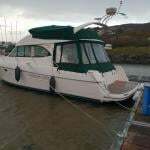 There may even be an en-route port of call to Northern Ireland or the Isle of Man, which could include a visit to a quirky port and an anchorage offshore to a secluded place you may not have heard of. Bessie Ellen will then head for the second Drogheda Maritime Festival (13,14 and 15 June) as previously reported and where in total five tall ships are expected to gather. If this whets your appetite to take a classic journey under sail and a chance to realise an ambition to step back in time on board a timber-built trading vessel then the Bessie Ellen is for you. She is only one of three surviving West Country ketches from more than 600 built as cargo-carrying vessels trading in the Irish Sea and northern Europe. Interestingly, in recent years she has carried commercial wine-cargoes as she still holds a licence for present day small cargo-handling. For example the French-owned Fair Wind Wine had chartered the vessel Bessie Ellen during the final Dublin Docklands Maritime Festival in 2010 for public wine-tasting! See below photo of the ketch during that festive occasion. Also attending the what would become the final Dublin Docklands Development Authority (DDDA) organised festival was the French 'gabre' or trading vessel, Notre Dame de Romengol, a somewhat trawler-like looking craft. So if you are interested in traditional sailing vessels offering sailing holiday voyages for 12 people and you have a zest for 'hands on' adventure why not become a crew member of Bessie Ellen. With that in mind, the final leg will be from the mouth of the Boyne and heading upriver to be greeted at the Louth port as part of the Drogheda Maritime Festival. 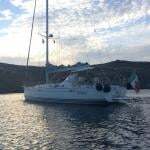 For further details and on prices, visit Classic Sailing's website HERE and above to hear her owner, Nikki Alford talk about her sailing holidays. In addition to further updates on the Maritime Festival posted on Drogheda Port Company website.